New Catering Policy in Railways: Objective to provide quality food to rail passengers, Indian Railway Catering and Tourism Corporation Limited (IRCTC) has been mandated to unbundle catering services on trains by creating a distinction primarily between food preparation and food distribution. 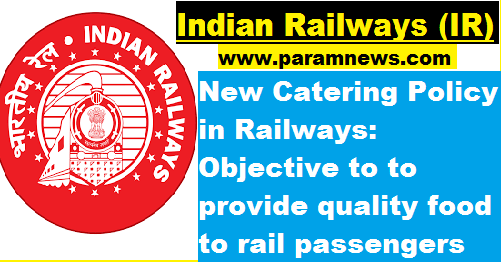 New Delhi, 17 July 2017: New Catering Policy has been notified on 27th February, 2017 wherein with the objective to provide quality food to rail passengers, Indian Railway Catering and Tourism Corporation Limited (IRCTC) has been mandated to unbundle catering services on trains by creating a distinction primarily between food preparation and food distribution. All four Base Kitchens under departmental operation of Zonal Railways (Nagpur, Chhatrapati Shivaji Terminus (CSTM), Mumbai Central (BCT) and Balharshah) and all kitchen units i.e. Refreshment Rooms at A1 and A category stations, Jan Ahaar, Cell Kitchens shall be handed over to IRCTC on ‘as is where is basis’. In order to upgrade quality of catering services, IRCTC shall set up new kitchens and upgrade existing ones. These kitchens will be owned, operated and managed by IRCTC. IRCTC shall retain the ownership and shall be fully accountable for all the issues pertaining to setting up and operation of the Base Kitchens and quality of food. In the first phase, unbundling of catering services is under implementation on Delhi – Mumbai Sector. Base kitchens & Jan Ahaars at CSTM and BCT have been taken over by IRCTC from Zonal Railways. New Catering Policy, inter-alia, stipulates that IRCTC shall manage catering services on all mobile units, meals for which will be picked up from the nominated kitchens owned, operated and managed by IRCTC. Further, IRCTC will engage service providers from hospitality industry for service of food in trains by giving adequate emphasis on availability of regional cuisine all over Indian Railways. As per new Catering Policy 2017, Menu and Tariff of food items will be fixed as follows:- (i) For Rajdhani/Shatabdi/Duronto trains and such other trains in which catering charges are inbuilt in the passenger fare, the menu shall be decided by IRCTC in consultation with Railway Board to make it commensurate with the tariff, which will be fixed by Railway Board. (ii) For controlled segment items/standard menu/Janta Meals on units handed over to IRCTC, the menu shall be decided by IRCTC in consultation with Zonal Railways within the fixed tariff approved by Railway Board. (iii) Menu and tariffs for Food Plaza, Food Courts and Fast Food units will be decided and fixed by IRCTC.